a few years ago for a contest. I was sitting outside reading a book and I heard this tapping sound. 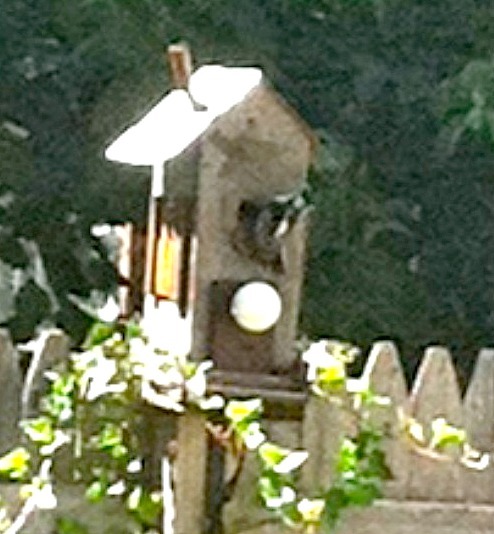 I looked over and saw a woodpecker sitting on the perch banging away at the hole in the birdhouse. Before I laughed myself off my chair I took a picture with my phone. These photos are terrible but there he was... trying to make the hole bigger! When he flew away I went over too get a closer look. See.... She was doing her own home improvements! I did the only thing I could do, I helped her out. I got out my drill and made the hole bigger for her. 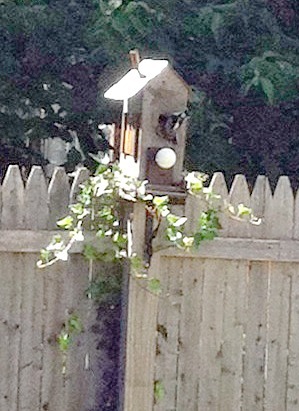 the birdhouse is already mounted to the fence. You can move in now Mrs. Woodpecker! Susan, that is too cute. At least that woodpecker loved the house, and has an eye for a unique home. I don't blame it. I would have tried to call it home myself. Love it. Sweet of you to help the feathered friend out. Have a great day. Haha, Susan! 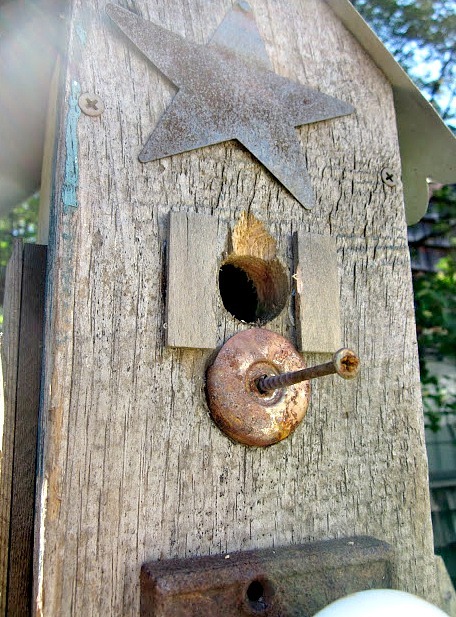 Are you saying your birdhouse was a "fixer upper"? : ) They say there's a buyer for every house, so I guess you found yours. He's already renovating and it was nice of you to help him out. Awww that is so cute!!! I just love that cute little bird doing home renovation! Very funny! I'm sure the woodpecker will appreciate the help! That is great!! That woodpecker knows good style when she sees it. She couldn't pass it by! Hilarious...who knew...DIY woodpeckers! So funny. I Love it!! I haven't had my coffee yet and I am already laughing!! Just think of all the cute little Woodpeckers you will have flying around in the Spring!! 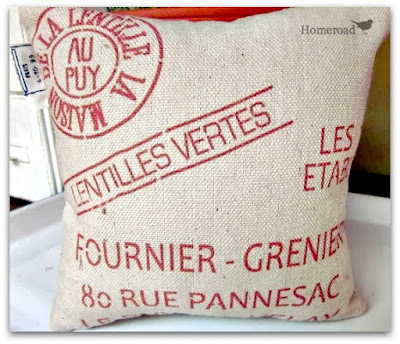 What a wonderful post! 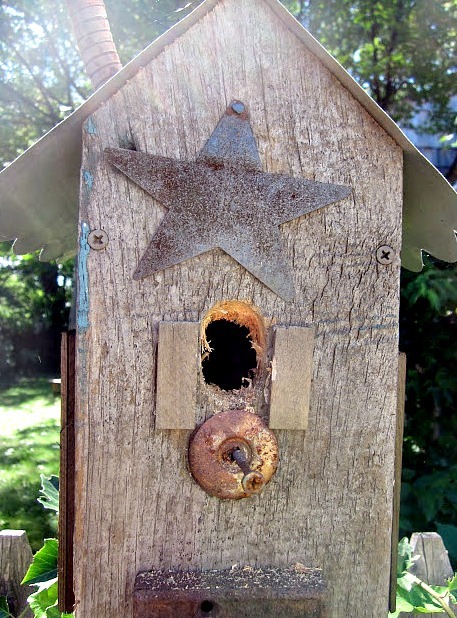 The birdhouse is a wonderful place to call home and Mrs. (?) Woodpecker knew a good home when she saw it. How cute Nancy!! I just love all birds. So glad you shared. Hope you are doing well. That is hilarious!!!!!! 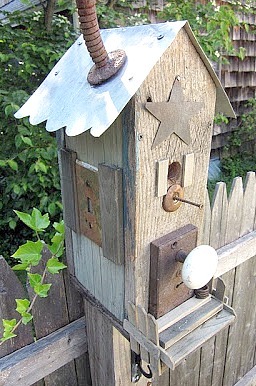 And I LOVE that birdhouse! Who knew the housing market was as bad for birds as it is for us?! 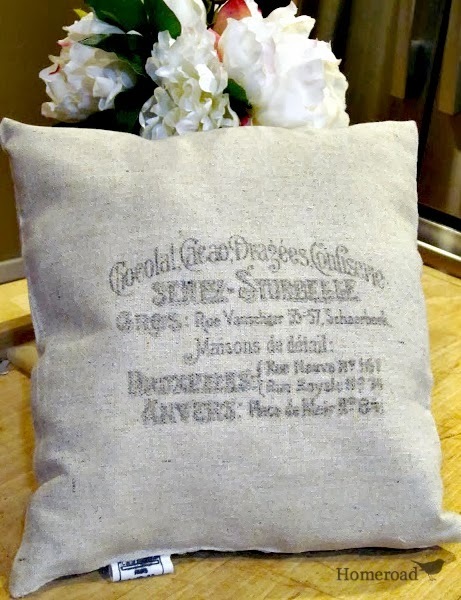 Flitting around and not sure how I got here but I am so glad that I have found your blog. The story grabbed me and connected me to your writings with a smile upon my face. I adore so many of your posts, dont think I dont yet this one swooped my heart up and made me feel fluttery. Much love to you this week.